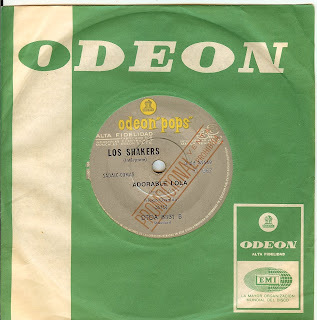 Los Shakers were from Uruguay, and brothers Hugo and Osvaldo abandoned a budding successful career in jazz when they heard the Beatles. These guys were YOUNG when they started (they were teens when they became professional jazz musicians) and the original lineup released three INCREDIBLE albums and a handful of singles (this is one of their non-LP tracks). Their 1968 album (which is essentially an answer to the Beatles Sgt Pepper LP) titled "La Conferencia Secreta Del Toto's Bar" is simply the best relatively unknown rock n roll (although it incorporates strong South American elements and even a few jazzy passages) album of the sixties. I would argue 'til I'm blue in the face about that! Los Shakers took a strong Beatles influence and didn't merely copy, but used their love for the Beatles to unlock their own creativity. Beatle-esque harmonies over a tropicalia sound; it doesn't get any better than 'Adorable Lola".